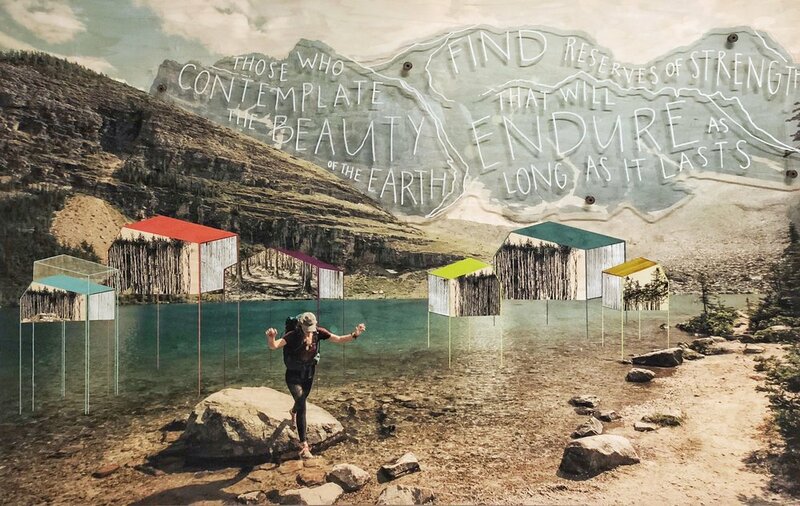 Something Independent, a Colorado company leading at the intersection of lifestyle and commerce, asked myself and two other female artists to create original artworks to showcase at the 2018 Denver Outdoor Retailer accompanying event, Trade School. The event aimed to explore the nature of work, and how Women, Water, and the West find their way to the core of real work. Working with outdoor photographer Kat Carney and artist Andrea Slusarksi was intriguing as it allowed me to let the other two pick up elements of the process that I usually do myself. Whereas I typically start artworks by painting/illustrating a natural landscape feature that will serve as the central subject of the piece, the images of Kat’s that were selected served as the backdrop from which Andrea and I’s creativity was allowed to play off of. Similarly, Andrea’s selection of words clearly conveyed the deep moral lesson the works intended to represent - a conveyance that is typically the product of much contemplation over how to illustrate those concepts through imagery. Most of my work contemplates the coexistence of man and nature, in both its grace and its destruction. These pieces are no exception. The treehouses in this piece are representative of what makes many American waterways and forestlands vulnerable: water pollution and deforestation. We cut down trees to build the structures that we live and work in, which is symbolized by the containment of illustrated forests in treehouses. We compromise the health of our surface waters by residing and manipulating the lands so near them, allowing pollutants to find their way into these waters and far beyond as they move freely through the Earth and atmosphere - represented by the proximity of the treehouses on top of the river. “Facades” is adorned with stark geometric features. These features symbolize the infrastructure raised by humans to enable life in otherwise uninhabitable environments such as deserts - infrastructure to move water, and to provide electricity across large expanses. Additionally, man and nature is contrasted in the parallel structures of organic, natural rock on the right with rigid, structural geometry on the left. Even in the harshest of environments, humans are still drawn to the free-flowing structures that nature builds over the course of millennia - we are drawn to the tradition of yearning to reach their highest points. You can see the talk here. 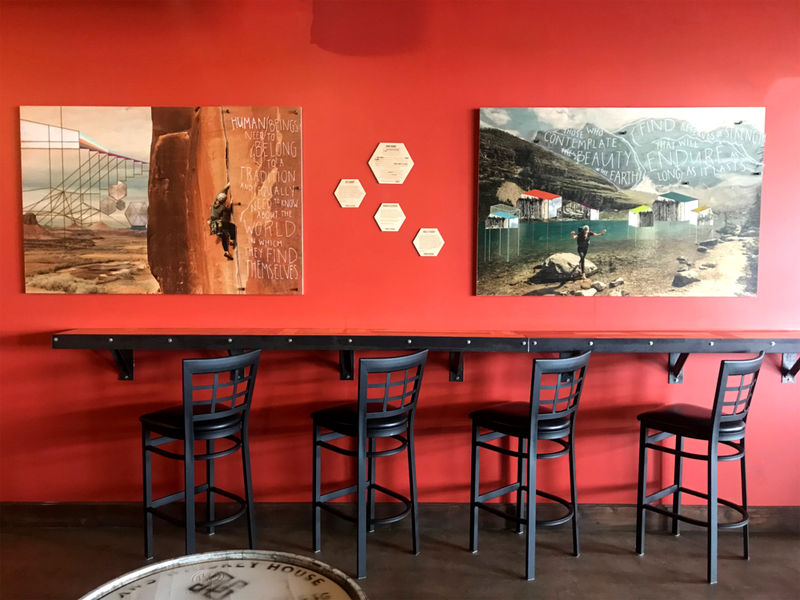 Both works are on display at Westfax Brewing Company in Lakewood, CO for Fall 2018, after which they will find a more permanent home. Special thanks to Chuck Sullivan of Something Independent for overseeing this project, to Andrea Slusarski for having the original artistic vision and for pulling Kat and myself in, to the geniuses at The Public Works for turning our combined visions into tangible works of art and for managing the installation of these works at Aloft and Westfax, and the Westfax Brewery for providing a lovely exhibition space for them before they land at a more permanent location.